Walangkura Napanangka is one of the senior women artists at Kiwirrkura. She is the daughter of Inyuwa Nampitjinpa. 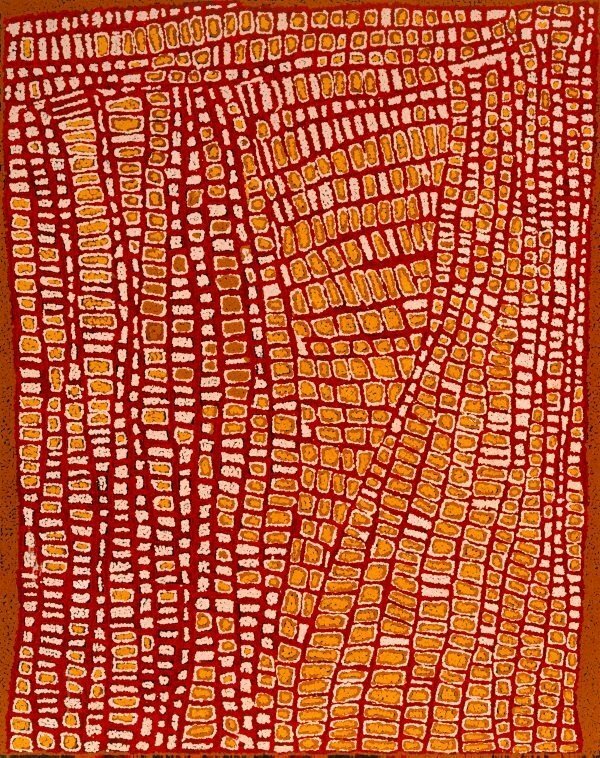 'Katungka Napanangka at Papunga', 1999, is a major painting by Walangkura in her distinctive style. The network of web of patterning in this painting is reminiscent of the cracks on rocks in the vicinity. In 1997 the Art Gallery of New South Wales purchased a collection of sixteen paintings by a representative group of women artists including examples of paintings by all the most important senior women from the Kintore/Kiwirrkura communities. In 'Aboriginal Artists of the Western Desert', 1994, Vivien Johnson states that at the time the book was published very few women from Kintore and Kiwirrkura painted regularly. For years many of these women have helped their husbands (who are some of the most famous of the Western desert painters) and have received no recognition or acknowledgement for their work. It is only recently that they have started painting in their own right. The Gallery purchased a small painting by Walangkura in 1997. Paintings by the Kintore and Kiwirrkura women refer to a large area of their ancestral country around the settlements of Kintore, Kiwirrkura and Tjukula - settlements and camps in the vicinity of the Northern Territory and Western Australia border, and the Gibson Desert. Rock holes and soakages form the most recognisable symbols in the women's paintings while Stories associated with the Tingari cycle of ceremonies are also painted by some artists. This is significant because the men's business associated with the Tingari Ceremonies is often represented in Western Desert paintings while works by women dealing with this subject matter are rare.